Fresh squeezed purple lemonade or fresh brewed iced coffee delivered to you June 21! 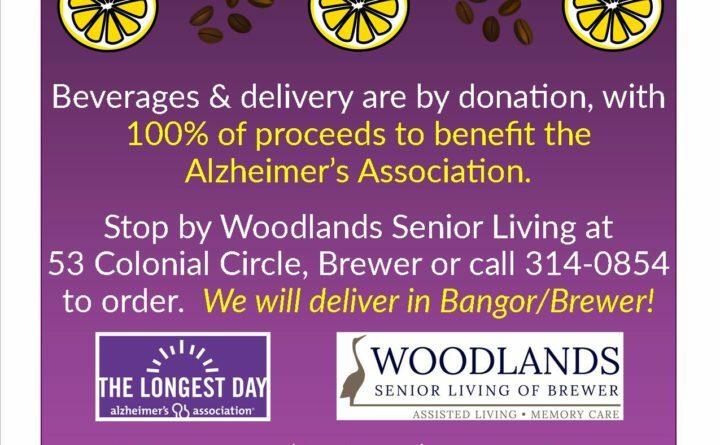 Beverages and delivery are by donation, with 100 percent of proceeds to benefit the Alzheimer’s Association. Stop by Woodlands Senior Living at 53 Colonial Circle, Brewer or call 314-0854 to order. We will deliver in Bangor/Brewer. From sun-up at 4:49 a.m. to sundown at 8:25 p.m., choose from fresh-squeezed purple lemonade or fresh-brewed iced coffee. On this longest day of the year, let’s fight to end Alzheimer’s Disease and find the first survivor.